Almost every workplace uses some form of flammable liquids. Cleaning solvents, paints, and certain laboratory chemicals are a few examples. The U.S. Bureau of Labor Statistics reported that fires and explosions in the workplace killed more than 200 people in 2015 and 2016. And for every fatality, there are many incidents that occur without the loss of life. The onus is on employers to implement safe practices for flammable liquid storage in their facilities. Laboratories use many flammable chemicals for performing analytical tests. Without adequate storage and handling procedures, lab analysts risk explosions and injuries. Justrite offers several flammable storage cabinets designed for laboratory use. Sure-Grip® EX Undercounter Safety Cabinets fits beneath a standard work counter. They feature recessed toe kicks, so users can stand closer to the work surface. This means less leaning and better ergonomics. Laboratories also use Sure-Grip EX Under Fume Hood Safety Cabinets. Lab workers store and handle chemicals directly at the work site. This limits the opportunity for accidents related to carrying chemicals around the lab. Vehicle shops and furnishers handle combustible materials like paints, aerosols and inks. Each individual container may be small, but the combined liquid volume can be large. Storage cabinets enable segregation of incompatible products. They also provide safe management of combustibles and ease of use. Store paints, inks and other Class III combustibles in Sure-Grip EX Safety Cabinets for Combustibles. Their adjustable shelves accommodate many smaller paint tins and different size containers. During repair operations, workshops and electronic parts companies wash parts with flammable cleaning chemicals. Workers must be protected from ignition sources. Specialized tanks and cans limit the exposure of flammable chemicals during cleaning. Safety Plunger Cans have smart pumps to bring cleaning chemicals into a perforated pan for moistening cloths. The bulk of the cleaning chemical remains in the rugged 24-gauge steel can, safe from ignition sources. Safety Bench Cans work on a similar principle, by providing an easy means of cleaning small parts in solvent. Justrite Safety Cleaning Tanks include dip tanks and wash tanks as a safe, portable solution to parts cleaning. A fusible link melts at 165 F (74 C) allowing the self-close mechanism to snap the cover shut in the case of a fire. Tank capacities range from 1-gallon (4-liter) to 8-gallons (30-liters). Larger capacity rinse tanks are also available for cleaning large parts. Download this fillable form to begin designing a custom safety cabinet built to your specifications. 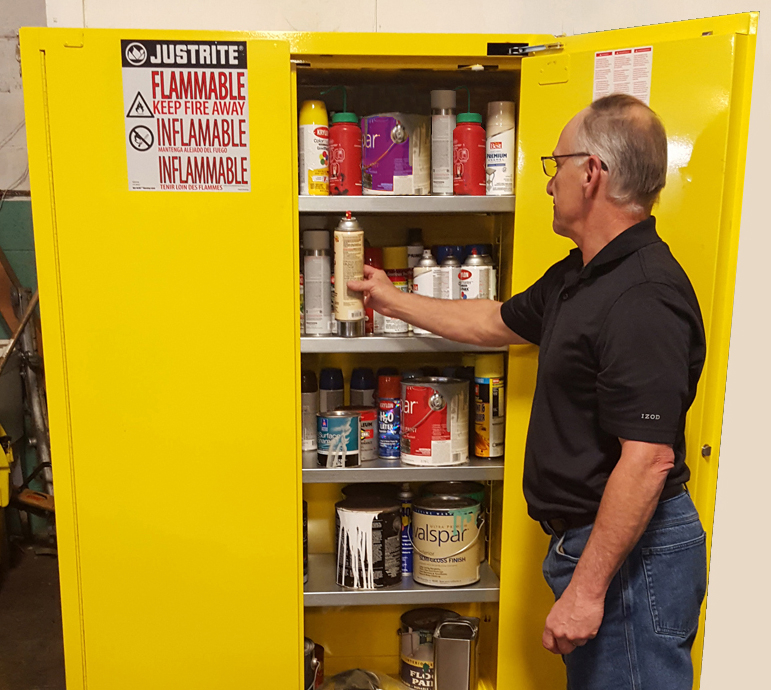 As the manufacturer of the world’s most widely trusted safety containment systems, Justrite knows how to store flammable liquids in the workplace. Learn more about our many flammable safety cabinet options.